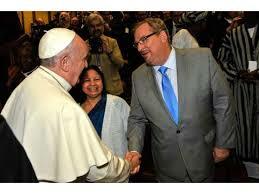 “If you love Jesus, we’re on the same team” Southern Baptist pastor Rick Warren once chirped. But what about Roman Catholicism’s false teaching regarding salvation and devotion to Mary? The heavily marketed, highly touted, and Scripture-denying “Together 2016” event was held on the National Mall in Washington, DC on Saturday, July 16. Thousands gathered on the mall and watched by live stream for the purported purpose to pray for Jesus to “reset” the country and their lives. The stream of celebrity evangelical “leaders,” pastors and musicians across the stage was essentially a who’s who of heresy. For the discerning believer who may have tuned in, markedly absent from the frenzy was a sense of reverence for a Holy God to whom appeals were being made to “fix our problems.” Oh yeah, the real Gospel was conspicuously absent too. Of course, the discerning believer will have recognized the real Jesus from the multitude of fictional ones being called upon from the stage’s center circle. The real Jesus would have not twisted Scripture to claim for America promises intended His chosen nation Israel. The real Jesus would not have bellowed out a repentance-free message of love, hope, and personal fulfillment. The real Jesus would not have jerked verses out of Scripture, encouraging listeners to name them and claim them for His, and their own, glory.